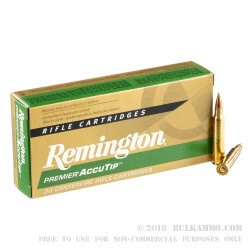 Remington’s answer to the popular loads from other manufacturers that offer polymer tipped projectiles in varmint or other game hunting loads. This is a 50 grain polymer tipped projectile that is loaded for maximum uniformity and deformation at impact on animals from varmint size up to intermediate game sizes. It will perform well on any target where a more uniform impact and higher energy delivery is imperative. The load is pricey by most standards, but the enhanced ballistic coefficient of the projectile design and the overall accuracy and reliability of not only the functional aspects of the round (feed, ignition and extraction), but also the functional aspects of the projectile itself (uniform expansion, better wind performance, higher energy delivery and grain weight retention). This is a value, therefore, despite the higher price paid for the 20 round box relative to other hunting rounds. Note the 50 grain projectile is suitable for small game, and may not be heavy enough, given certain state regulations for use in hunting some intermediate and large game animals. Please check your local and state regulations before using this ammunition for such a hunting excursion. 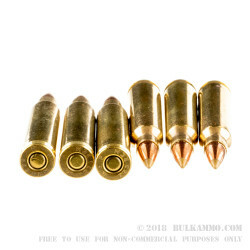 Top quality brass, the accurate “AccuTip” bullet and static ballistics as follows (3410 feet per second velocity and 1291 ft. lbs. of energy at the muzzle) makes this a potent choice for many game species at moderate ranges.